Six veteran astronauts are suiting up to fly the space shuttle Discovery to the International Space Station tomorrow (Feb. 24) on the final voyage of the orbiter's long and illustrious career. The spaceflying crew of Discovery's STS-133 mission is slated to launch Thursday at 4:50 p.m. EST (2150 GMT) after months of delays, primarily due to cracks that were found on structural ribs within the shuttle's external fuel tank. But the astronauts who will commandeer Discovery have not been without their own drama. A bicycle accident on Jan. 15 sidelined mission specialist Tim Kopra, forcing NASA to replace the injured astronaut less than six weeks before launch. Steve Bowen, an experienced spacewalker, stepped in to fill Kopra's shoes in what NASA said was the closest crewmember replacement before launch since the Apollo 13 flight. 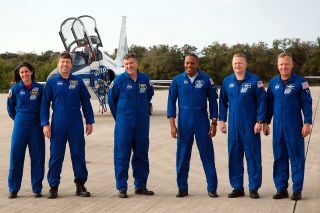 The five men and one woman who will take Discovery on a final ride before NASA retires its shuttle fleet later this year are not only accomplished spaceflyers, but also a close-knit group of friends. During a simulated launch countdown, the STS-133 crew walks out of the Operations and Checkout Building to the waiting Astrovan at NASA's Kennedy Space Center in Florida. Commander Steve Lindsey gives a thumbs up to Kennedy employees who are cheering for the crew. Steve Lindsey, 50, is the commander of the mission. A native of Temple City, Calif., Lindsey is a retired colonel in the United States Air Force. He was selected as an astronaut candidate by NASA in 1995, and has made four spaceflights, two of those on shuttle Discovery. "Discovery is a workhorse – fleet leader in number of flights," Lindsey said in a preflight briefing. "It's a privilege to be able to fly the last flight of Discovery." The strong but soft-spoken Lindsey said he is excited to lead his fellow crewmembers on the 11-day expedition to the International Space Station. "Personally, I'm really excited to be flying with this crew," Lindsey said. "They're a fantastic group of people to fly with. Somebody once told me, you'll find as you get more experience, it's less about what you do on a mission, and more about who you get to fly it with. And I think that's really true in this case." Lindsey is married and has three children. Eric Boe will serve as the pilot of STS-133, Discovery's 39th flight. The 46-year old native of Atlantais a colonel in the U. S. Air Force, and was selected to join NASA as a pilot in July 2000. Boe completed his first spaceflight on NASA's STS-126 mission on the space shuttle Endeavour. At a preflight briefing, Boe reflected on the significance of being part of one of the final flights of NASA's space shuttle program. "I think all of us are happy to be on another flight," Boe said. "It's a little bittersweet when something comes to an end, but it's a privilege to be able to fly the vehicle." For the upcoming mission, Boe said he is most looking forward to gaining new experiences and working as a team with his other crewmembers. "When you're up there, things go pretty quick," he said. "I think I'll have a little more time to look around and pay attention to the small details. The biggest overall thing I hope to get out of this is to really absorb some of the small details I might have missed on the first flight." Boe is married and has two children. Mission Specialist 1 Alvin Drew, 48, is a recently retired colonel in the U.S. Air Force. During the crew's stay at the space station, Drew will participate in the mission's two spacewalks. Drew, who was born in Washington, D.C., was selected as a mission specialist by NASA in July 2000, and made his first spaceflight aboard the shuttle Endeavour for STS-118 in 2007. Having grown up dreaming of becoming an astronaut, Drew admitted that his spaceflying career seems almost surreal at times. "[Becoming an astronaut] was one of the things that was in the back of my mind during my Air Force career, but nothing that I really took that seriously," he explained. "I think depending your career on becoming an astronaut is like planning your pension around winning the lottery. It's something that you can go pursue, but you should have a 'plan B' in place. I did everything to stack the deck in my favor, but never really expected it would happen." Drew's spacewalks on Discovery's STS-133 flight will be the first of his career, and he said he's proud to contribute to the future of the orbiting laboratory. "Hopefully I can come back in 2020 and see the station working and think, 'I had a small part in keeping it going this long,' " he said. Mission Specialist Steve Bowen was picked to replace the injured Tim Kopra on the STS-133 flight. Here, he uses a communication system during a training session in the fixed-base shuttle mission simulator inside the Jake Garn Simulation and Training Facility at NASA's Johnson Space Center. Steve Bowen, born in Cohasset, Mass., was selected by NASA as an astronaut candidate in July 2000. Bowen, 47, began his training in August of that year, becoming the first submarine officer selected to be a mission specialist. Bowen has participated in two previous spaceflights: Endeavour's STS-126 mission in November 2008 and the most recent STS-132 flight of Atlantis in May 2010. He has logged more than 27 days in space. A veteran spacewalker, Bowen has completed five spacewalks for a total of 34 hours and 30 minutes spent outside of the orbiting outpost. Bowen joined the STS-133 crew after mission specialist and lead spacewalker Kopra was injured in a bike accident on Jan. 15. Bowen immediately began training for the mission's two spacewalks, aimed at upgrading the space station and installing spare parts to the laboratory's exterior. Bowen is married and has three children. Michael Barratt joined NASA's Johnson Space Center in Houston as a project physician in May 1991 and was subsequently selected for astronaut training in July 2000. Now, the doctor-turned-astronaut will perform duties as Mission Specialist 3 on Discovery's last spaceflight. In March 2009, Barratt embarked on his first spaceflight, launching on a Russian Soyuz TMA-14 rocket to the International Space Station. During the long-duration mission aboard the orbiting outpost, he logged 199 days in space. "I was surprised how little free time we had on our station mission," Barratt said in a preflight interview. "After six-and-a-half months, we were still working very long days. I wouldn't call a station mission leisurely in any way, shape or form." In light of Discovery's final mission, Barratt maintains that a lot of the glory belongs to the people who, over the years, maintained the shuttle between flights. "The orbiters look great. If you just landed and didn't know the political landscape, you'd never know the program was coming to an end, because the birds are so pristine," Barratt said. "Everybody is incredibly dedicated. They're doing what they're doing for all the same reasons they signed on for years ago." Barratt, 51, calls Camas, Wash. his hometown. He is married and has five children. Astronaut Nicole Stott, STS-128 mission specialist, poses for a photo with a NASA spacesuit on the middeck of the space shuttle Discovery on Aug. 30, 2009 during docking activities at the International Space Station. Nicole Stott is the Mission Specialist 4 for Discovery's upcoming flight. She began working at NASA's Kennedy Space Center in 1988 as an operations engineer in the Orbiter Processing Facility. Stott, 47, was selected for astronaut training in July 2000 and launched on her first spaceflight to the International Space Station in 2009, also aboard Discovery. The mission also marked Stott's first long-duration tour of duty on the orbiting station. While living and working on the space station, Stott completed one spacewalk and spent a total of 91 days in space. Stott's second journey on Discovery will also be the orbiter's last, and in a preflight briefing, she spoke about the prolific shuttle's storied career. "It's a historic thing that we have such a special vehicle to fly," she said. "The hope, in addition to having a successful mission, is that we'll be celebrating the real significance of the vehicle itself. We have to look at this as a celebration of just how wonderful Discovery has performed." Additionally, having grown up in Clearwater, Fla., Stott knows firsthand the impact and enduring legacy that NASA's space shuttle program has had on the country. "There's nothing negative that you can say about it," Stott said. "There are only positives and encouraging things that have come from this program." Stott is married and has one child. Follow SPACE.com Staff Writer Denise Chow on Twitter @denisechow as she covers Discovery's final space voyage from Cape Canaveral, Fla.